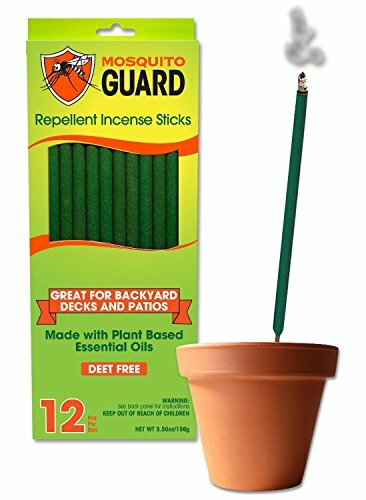 Mosquito Guard Incense Repellent Sticks – 12 inch Incense Sticks Made with Natural Plant Based Ingredients: Citronella, Lemongrass & Rosemary Oil - 12 Sticks per Box by Mosquito Guard at The Net Stores Network. Hurry! Limited time offer. Offer valid only while supplies last. NATURAL INGREDIENTS: Our Mosquito Repellent Incense Sticks are made with Citronella, Lemongrass and Rosemary plant based essential oils. DEET FREE - Our Repellent Incense sticks are completely DEET FREE. OUTDOOR MOSQUITO PROTECTION: Each one of our Incense repellent sticks can stay lit for about 2.5- 3 hours (wind may impact burn time) so you can enjoy your time outdoors. OPTIMAL PLACEMENT OF STICKS: We recommend customers place four or five incense sticks to create a perimeter around a patio or deck, spaced 12-15 feet apart. We recommend that you keep the sticks as low to the ground as possible. PERFECT FOR ANY OUTDOOR ACTIVITY: Ideal mosquito protection while outdoors: whether at home on the patio, deck or backyard; at the park, beach, or pool deck; while camping, fishing or enjoying any other outdoor events. If you have any questions about this product by Mosquito Guard, contact us by completing and submitting the form below. If you are looking for a specif part number, please include it with your message.